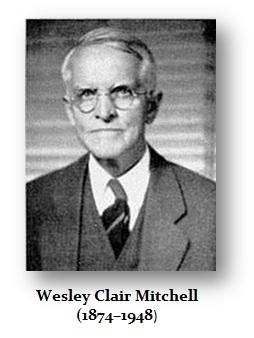 Wesley Clair Mitchell American economist. Educated at the University of Chicago, where he was influenced by Veblen, he later taught at Chicago, California and Columbia universities. He was one of the first researchers to use statistical techniques in the investigation of economic phenomena, in particular the determination of the level of business activity. His researches gave an impetus to quantitative work in many branches of economics. His first important publication was Business Cycles (1913) and this field continued to be his primary interest. Measuring Business Cycles written with A. F. Burns, was published in 1946.